A German shepherd named Haus who was bitten three times by a rattlesnake has returned safely home after more than a week of care at BluePearl Veterinary Partners in Tampa, Fla..
It’s a happy ending for Haus, who received multiple vials of anti-venom and round-the-clock monitoring as BluePearl veterinarians brought him back to health. “This is why I do my job,” said Dr. Danielle Pollio, one of the veterinarians who treated Haus. Haus will need follow-up checks, but his long-term prognosis is good, she said. She credited her fellow veterinarians, veterinary technicians and the entire BluePearl staff for a team effort. At a news conference on Thursday, Donya and Adam DeLuca, Haus’ owners, said they were grateful to BluePearl’s veterinarians for the care they provided to Haus, which they credited with saving the dog’s life. Also at the news conference, Mars Petcare, parent company of BluePearl, donated a year’s supply of Nutro dog food to the family. The DeLucas, in turn, said they would donate the pet food to an animal rescue group called Heidi’s Legacy Dog Rescue. 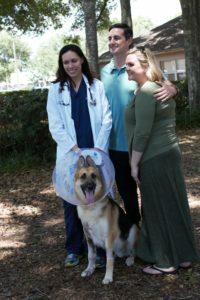 The experience of Haus and the DeLuca family shows the dangers pets and humans face from poisonous snakes in Florida – and how important it is to get victims to a hospital immediately after being bitten. The incident occurred on May 11. Adam and Donya DeLuca said their 7-year-old daughter, Molly, was in the backyard of their New Tampa home with Haus and Donya’s 75-year-old mother when the dog suddenly yelped. No knew it at the time, but Haus had been bitten by a snake. Haus didn’t give ground, and was bitten an estimated three times. “He was protecting my child,” said Donya DeLuca, who rushed home from work after getting a phone call to alert her about what happened. The DeLucas rushed Haus to a nearby emergency veterinary hospital. He was later taken to his regular veterinarian, who recommended a transfer to BluePearl, which has a 24-hour emergency room and highly trained veterinary specialists.